birds : Half-term week has been rather pedestrian bird-wise. Just busy doing other things mainly, but also having a cold hasn't given me much enthusiasm to get out and about. Early in the week I had a couple of dark Buzzards drift high NE over the house and a Slavonian Grebe in Grandes Rocques Bay. 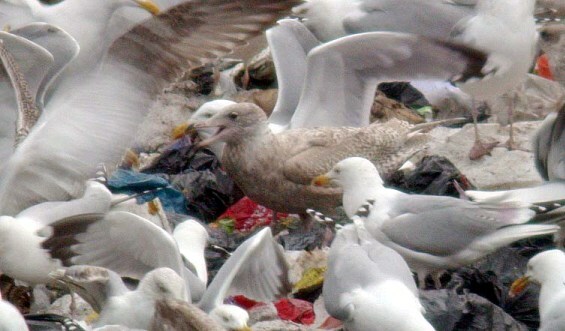 I have made about 4 attempts to see the Glaucous Gull at Mont Cuet Rubbish Tip and I finally saw it today amongst the rabid hordes devouring the island's putrified crap. Late morning today I had a wander round the Track Marais (or St. Sampsons Marais). This is the least-disturbed open marshland on the island and would produce more good birds if it wasn't so tricky to get visit - I had to squeeze through a fence, hurdle a stream and climb through barbed wire. It is the most reliable site for wintering Reed Bunting on the island and I soon saw a single female bird perched on a bush. There were plenty of duck present today, with 33 Teal, 6 Shoveler and 2 Gadwall noted. It is also a good place for Jack Snipe but flushing them is hit and miss - I only flushed 4 Common Snipe and a Water Rail today. nonsense : The Winter Olympics has been on TV quite a bit this week but even though I like sports, it is difficult to summon up any enthusiam for it. I am not a fan of minority sports in general, because you know that really the Olympic speed-skating, or ski-jumping, or luge champion is not actually the best in the world at that sport because only 0.000001% of the world's population have ever tried it. Whereas the 100m sprint running champion will be the fastest in the world, and the top footballers will be the best in the world, because everyone has run or kicked a ball before. I'm sure the competitors have worked really hard but that's just the way it is. However, saying all this, in the pub last night we decided that the Russian women's Curling team were worthy of our support !! [N.B. - Of interest, the "Skeleton Bob" event was actually named after the 19th Century pirate who invented it]. Tuesday was Abigail's 9th birthday and I was very proud of my first foray into the world of cake decorating.